History without palaeography is a story half told. Here is a small example from the first decades of the sixteenth century. It comes from my monograph on The Renaissance Reform of the Book and Britain which I am presently completing. I present to you, in part, because I want to invite you to comment on the evidence I have for you. It is often said that the Brescian humanist, Pietro Carmeliano, was the man who introduced the italic hand into England. The situation, as I explain in my book, is rather more complicated than that, but that is not the issue today. It is also said that he was the first person appointed as the king’s Latin secretary in the mid-1490s. It is true that he revelled in that title, though quite what it signified is open to discussion. He certainly produced a substantial quantity of correspondence for Henry VII; the first sign we have of his acting as a royal scribe (this evidence seems to have been overlooked) is from 1488. If you want not just to see his elegant script but to own a specimen, you may be lucky: not all are in public collections and some do appear for sale. One was up for auction last year and by the look of the note added at the top it somehow strayed (presumably in the nineteenth century) from the Archivio di Stato in Milan. Another letter written by him was sold at Christie’s a few years ago; the auction house kindly tells me is now in private hands. The story also told is that Carmeliano’s fortunes withered in the wake of Henry VII’s death. Other humanists celebrated the accession of his son as a new golden age. One of these poets was Thomas More, though, as I argued many, many years ago, his praise of the young Henry VIII was not as straightforward as it at first appears. Its classic statement, though, was provided in prose by an Italian, from Lucca, who called himself Andreas Ammonius (and who is now known as Ammonio). In a letter to Erasmus he ghost-wrote for William, Lord Mountjoy, Ammonio declared that this would be a new era of liberality, and he himself benefitted from it. In an act which is seen as a symbolic changing of the guard, he took on the role of the king’s Latin secretary, being first mentioned as that in 1511; Carmeliano, it is suggested, was yesterday’s man. Let us leave aside that Carmeliano did not quit the scene and continued to be referred to as Latin secretary himself. That is significant for what I have to say here only in as much as it suggests that the position was not an exclusive one — and earlier evidence suggests that there was more than one secretary for Latin correspondence in earlier years. These men, in fact, included Andrea Ammonio himself. A royal letter, signed by Andrea Ammonio, dated 24th June 1515. This, as you will see, is dated from June 1515, four years after the first reference to him as Latin secretary. This script, though, appears in earlier unsigned letters. At this point, I am going to have to ask you to open another tab and visit the wonderful Portal de Archivos Españoles site. On the page Inventario Dinámico choose the Archivo of Simancas, and under their Colecciones, choose Patronato Real. You are then looking for ‘Leg. 54’ and for two particular items in it. The first to find is document 99. 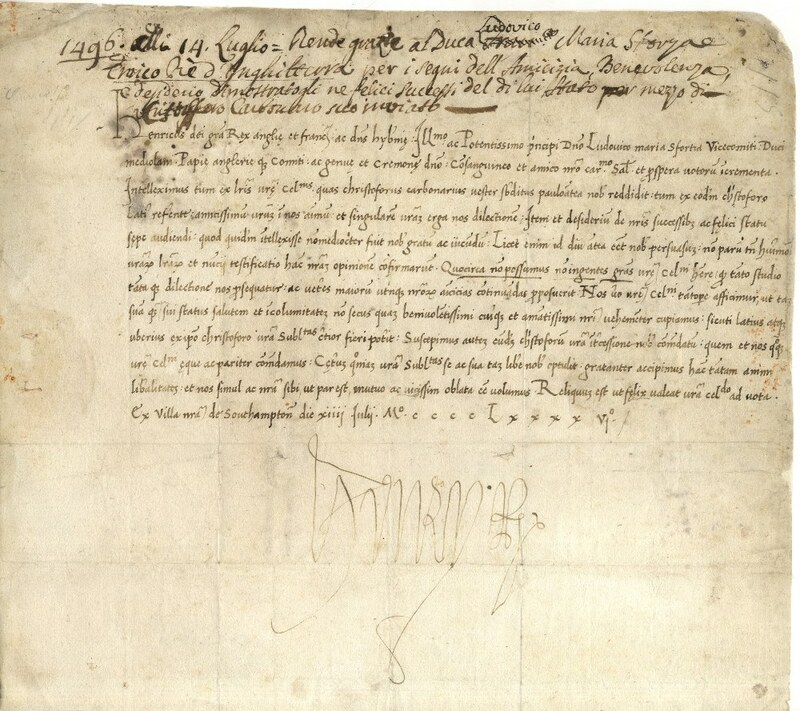 It is a letter to Ferdinand of Aragon dated 30th July 1509 and signed by the new king Henry VIII (it also appears as item 52 in the catalogue of the 2009 British Library Henry VIII exhibition). Look at the script and compare it with what you see above: can you see the similarity? If not, take time to survey the details: look at the tick used sometimes on final e, and the left-turn on the foot of p and q, or look at the shape of the g, or the st ligature. There are so many shared characteristics in detail and in overall aspect that I am confident in proposing that this is by Ammonio as well. If you do not share my confidence, then your next challenge is to tell me: who else could this be at this date? Incidentally, note how fitting it is that he should be employed for a letter on behalf of Henry’s friend and the person from who Ammonio drafted the letter to Erasmus, William, Lord Mountjoy. This, though, is not all. In 1509, Ammonio had already been resident in England for four years. Now find the document known as Leg. 54, Doc. 70. You will see that this is dated 18th October 1506. Your first impression might be that this is by a different hand from the others you have just seen and certainly the script is thinner, more upright and less assertive — it seems to be by a person learning their trade. Then look more closely, comparing the 1509 and 1506 letters together: look for the ornate ‘quam/quan’ abbrevation, or the placing of the suspension mark for ‘que’ or, indeed, the styling of the serifs. This, I suggest, is once again by Ammonio, not yet settled into his role and essaying his own humanist cursive. In developing his practice, he would have turned to exemplars he had to hand or to a colleague — that is, most likely, to Pietro Carmeliano. The implication of this evidence, in other words, is threefold. First, Andrea Ammonio was involved in the production of royal letters alongside Carmeliano. This, in turn, suggests that we might need to rethink our impression that there was a simple sequence of office-holders: it seems more likely that the title of secretary was an honour given to those who produced the letters, rather than being an exclusive post available only to one person at a time. Finally, what these letters also suggest is that Ammonio may well have owed his first entrée into working for the crown to Pietro Carmeliano. This, of course, does not mean that a rivalry may not have later developed, though we should also not assume that Carmeliano was cast out into darkness when the sunshine of Henry VIII’s munificence shone on Ammonio. In later years, Carmeliano was a rich man. What is more, though he was Ammonio’s elder, he outlived him: the younger humanist succumbed to sweating sickness in the summer of 1517. In 1520 (and, again, this has been undernoticed), Carmeliano was describing himself as secretary to Henry VIII. The point of this tale is to remind ourselves as historians that reading documents, however subtly, is not enough if we want more fully to reconstruct events like those around 1509. By close attention to the palaeography, with due care and attention to its pitfalls, of course, we can move towards a richer understanding. This might be expressed as a paradox: to delve deeper, we have to appreciate these sources at their face value. On the other hand, this could be entitled ‘Notes from Christ Church Library’ and be a contribution to that beguiling but non-existent journal, Aperçus & obiter dicta. My work in Christ Church has seen me pore over the earlier catalogues of the library or, more precisely, of its ‘archives’ in an attempt to reconstruct the physical history of the manuscript collection. The codices have only been held in the ‘New Library’ since it was opened in the 1760s. Before that, the books of Christ Church were held in a room — I remember it being used in my day (as the old say) as an undergraduate set — off the cloister of St Frideswide’s. Not quite all manuscripts were kept there as some were considered to belong to the Chapter as opposed to the ‘college’ (a misnomer in this dual institution but a usage that appears often enough in the records of the place that likes to call itself the House). It was, in fact, only with the move into new premises that a space was set aside as the near-exclusive preserve of manuscripts. Earlier, what was considered fit for the ‘archives’ combined printed books with some handwritten codices. It was an arrangement that existed from the 1670s, but which underwent a significant transformation in the wake of the death in 1710 of Henry Aldrich, dean of Christ Church and polymathic bon-viveur, whose interests ranged across languages and disciplines. His collection in large part became the property of the House, and the contents of the Archives came to be dominated by his music collection, skilfully described by John Milsom in the excellent on-line catalogue. What, curiously, seems not to have been included in that section of the library at that point were the few manuscripts Aldrich himself owned. It was only with the move and the re-organisation work overseen by Edward Smallwell, later bishop of Oxford, that the books created by Aldrich and some owned by him were given pride of place in the new ordering of the Archives. I have described the archives of the 1760s as providing a ‘near-exclusive’ preserve for hand-written volumes. There are some exceptions, usually there because of a direct association with the former Dean, including, for instance, ‘Aldrich’s Logick’ a volume which combines two printed editions of that work. Close by that volume in the catalogue compiled by Smallwell is an entry, A.13, for ‘Henricus octavus de Sacramentis. 8o.’. Clearly, this is a copy of the anti-Lutheran tract, the Assertio septem sacramentorum, which announces Henry VIII as its author. After it had been printed in Richard Pynson’s workshop in 1521, several copies were all bound in the same style by John Reynes, with the Tudor Rose and English royal arms on the panels. The copy that is still resident in Christ Church, now with the shelfmark Z.e.6.4, is a fine example of this (I have Christ Church’s ever-helpful Special Collections librarian, Cristina Neagu, for the photographs shown here). This much is relatively well known. It has also been surmised that the intention of these bindings was to beautify some copies so that they could act as diplomatic gifts or presents to favoured subjects.We do not know who the first recipient of the Christ Church copy was but what perhaps is not as well known is that we can say something of the volume’s history, for at its title-page it has a signature. As is clear, this was owned by William Cecil, who was to be first minister to Henry VIII’s younger daughter. The script is close enough to other ex libris he wrote to be definably his, though it style, and the absence of any reference to his title of Lord Burghley, might suggest this was written fairly early in his career (for a contrast, see his note at fol. 1 of BL, MS. Harl. 2471, for instance). Given that he was born only in the year that the Assertio was published (or perhaps the year before), then Cecil could not have been its first owner. But, clearly, he thought this work was worth owning, however far the Church of England which he did much to support had moved away from the doctrinal position espoused in the text. It would appear that the volume remained in the Cecil family until the famous sale of the collection in 1687: the work is recorded in the sale catalogue as ‘libri theologici, in quarto’, no. 23. At that point or soon after, it must have reached the hands of Henry Aldrich. It was not his habit to add his ownership note to his books but a listing of his library made after his death does include this work and, as I have said, its placing in Smallwell’s arrangement of the Archives is suggestive of that provenance. When the future bishop of Oxford came to look at this book, he might have considered there to be something pleasing about having a distinguished copy of the Assertio in the foundation created by the text’s acclaimed author. Christ Church was an arriviste on the Oxford scene. The brainchild of England’s most successful butcher’s son, it was founded as Cardinal College only in 1525, when the number of colleges of the university was already in double figures. On Wolsey’s fall, his institution became, in name at least, King’s College, to wallow in neglect until Henry VIII’s attempts to appease the gods for his desacration of the established church by replacing monasteries with new bishoprics led him, at the very end of his reign, to establish in Oxford an institution that combined cathedral and college. It makes Christ Church a unique institution, adding to the roll-call of titles for Oxbridge heads of house (Master, Principal, Warden, Provost, President…) by being the only to one to be ruled by a Dean. Christ Church might be, then, a new foundation but, like those ennobled from his mates and sidekicks by Henry VIII, it has become part of the fabric of the establishment, the Oxford institution with the closest links to royalty. Not, it must be said, that its illustrious contribution to history — boasting thirteen Prime Ministers, the founders of both Pennsylvania and New Zealand, let alone philosophers, religious reformers and poets among its alumni — is what is uppermost on many visitors’ minds nowadays; it is not even its reputation as the home of Charles Dodgson, aka Lewis Carroll, that attracts people; as I heard a tourist guide say to his teenage flock the other day, it is now known as ‘Harry Potter’s college’. The late date of its creation and its distinguished connexions both have an interesting effect on its manuscript collection. Christ Church was founded when printed books were already occupying libraries to over-filling; while hand-written books still had an important cultural position and could provide texts not available in print, there was no need for a core of codices as there had been in, say, Merton, or any likelihood of a single donation formed solely of manuscripts, as there had been with the bequest of William Gray, bishop of Ely (d. 1478), to Balliol. At the same time, the young parvenu could not but expect to receive manuscripts as signs of respect from individuals who had been educated in its walls or who had passed through them. The result is a collection that is wonderfully eclectic and also well-stocked with richly decorated volumes. It is with one such manuscript, of suitably aristocratic heritage, that my recent small discovery is concerned. Guy XV, count of Laval, from Oxford: Christ Church, MS. 93, fol. 1. Copyright: Dean and Governing Body of Christ Church, Oxford. The volume is a late fifteenth-century Book of Hours, which came to Christ Church as part of its most substantial donation, that of William Wake, himself an alumnus whose career culminated in his tenure of the Archbishopric of Canterbury. His early career saw him in France and it would be attractive to imagine that this Book of Hours came into possession while there. It is certainly a French production but one so rich in illumination that it may be that Wake could only afford to purchase it later in his life. 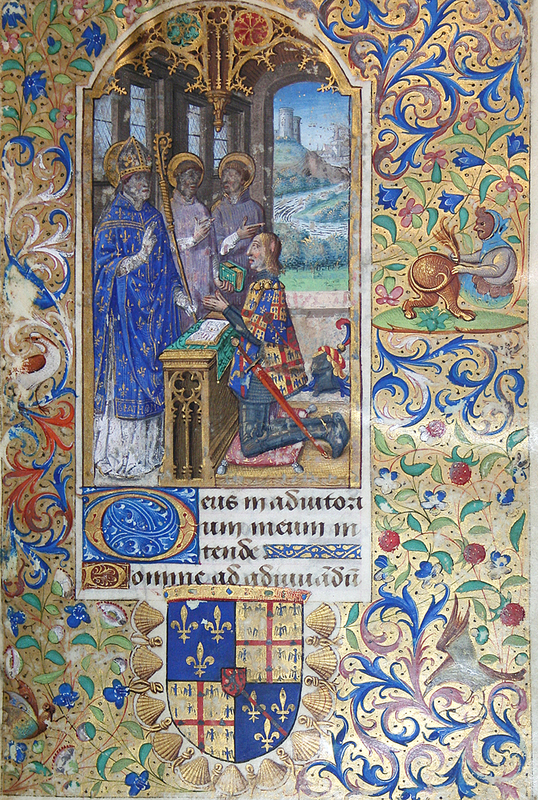 The volume, called the Hours of St Denis, opens with an illumination depicting its commissioner, Guy XV, comte de Laval from 1484 to his death in 1501, a significant political figure with lands in Brittany, richly awarded for his loyalty (while others were not) to the Valois monarchy. The images that enliven every page of this manuscript have been (surely correctly) attributed to an artist known as Maître François. 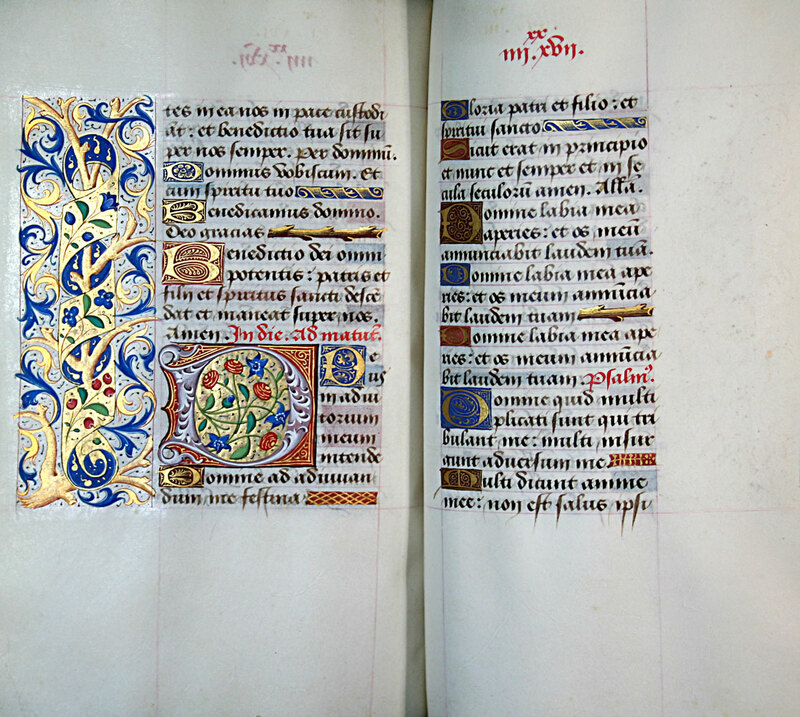 As Thomas Kren demonstrated in an article published in the festschrift to Margaret Manion in 2002, this illuminator was one who worked with a scribe who produced several Books of Hours and who (unusually for copyists of devotional manuscripts) identified himself in one book, the Hours of Jacques of Langeac (now Lyons: Bibliotheque muncipale, MS. 5154). The scribe’s name was Jean Dubreuil, who was active between c. 1465 and c. 1485. What has not been noticed — but what will already be obvious from the title of this post — is that a comparison of the leaves of the Christ Church manuscript with others by Dubreuil shows this book to be an unsigned manuscript by this scribe. It has all the characteristic features of his flowing lettre bâtarde, with the prominent loop on top of the d and the hair-strokes on letters including the e. What is interesting is that the Christ Church book could not have been written before 1484, late in Dubreuil’s known career. Perhaps, though, it was not produced much after that — each count of Laval not only had to take on the name ‘Guy’ but also to adopt the comital coat of arms. Perhaps, then, Guy XV had this Book of Hours produced to celebrate his recently attained status. Perhaps, also, he chose the contents of this lavish volume for private devotion to demonstrate that his own loyalty was not to Brittany but to France. It might, in other words, have been a ‘private’ book but it was one for which using accomplished craftsmen was appropriate for it provided a ‘public’ message. An opening from Oxford: Christ Church, MS. 93, showing script of Jean Dubreuil. Copyright: Dean and Governing Body, Christ Church, Oxford. Last week saw me at Windsor, to see the exhibition to celebrate the quincentenary of the accession of the tyrant, Henry VIII. If one undertook the trip and paid the entry fee to the Castle just to see this small exhibition, and did not stay to stand in awe within the splendour of St George’s Chapel, or to marvel at the quality of paintings amassed in the royal apartments, one would be disappointed. There are no revelations or new insights into the career of the second Tudor, and, in several instances, original works by Holbein are substituted by later prints or copies. That, in itself, though, set me thinking. For someone more familiar with the tale of the late recognition in England of the artistry of the ‘Italian primitives’, what struck me was the recurrent high regard in which the German father of English portraiture, Hans Holbein, has been held. 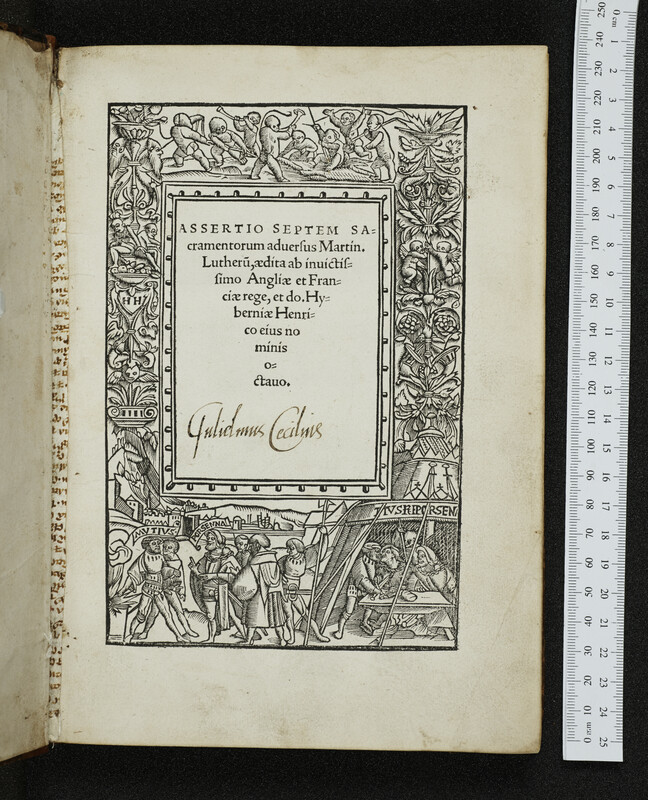 ‘Recurrent’ is probably a better term than ‘continuing’ would be: the fortunes of the ‘great book’ of Holbein’s drawings suggest a disrupted journey. In royal hands in the mid-sixteenth century, it was in the collection of Lord Lumley by the 1580s. On his death, it passed to Henry, Prince of Wales, the ill-starred son of the first Stuart. It thus returned into royal ownership, only to be given away by Henry’s younger brother, Charles I. In the late 1620s, he was willing to part with it, in return for a ‘little St George’, which happened to be by Raphael. The fact that the king parted with a whole set of Holbein drawings for this one small image — now in the National Gallery of Art in Washington, D.C. — perhaps helps us calibrate the distance in standing between the two artists, in the eye, at least, of one distinguished collector. But the Holbein book was hardly thrown into the outer darkness: it passed into the hands of Thomas Howard, earl of Arundel, himself a respected and fashion-leading connoisseur. After the Restoration, the drawings were, as it were, repatriated, becoming part of the collection of Charles II. Even then, though, its adventures were not over for, it is said, in the early eighteenth century, it lay discarded until ‘re-found’ in 1727 in Kensington Palace. My suspicious mind does wonder whether this last episode may be one of those myths of loss which can accrue to objects later considered precious and which actually come to form part of their mystique. 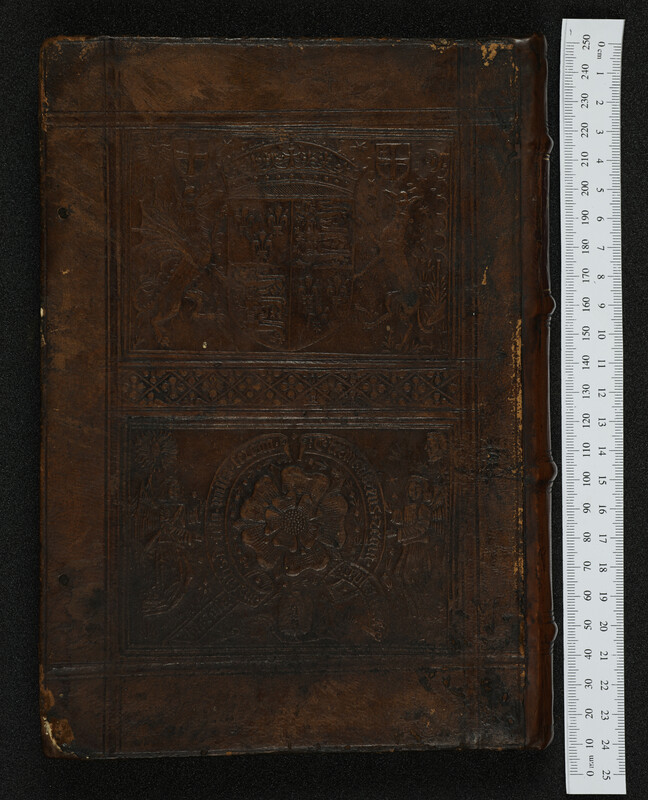 The claim of underrating can, on occasion, be used to justify a change in the status of the object and that certainly happened in this case: the book was dismantled and, under the guidance of George Vertue, the individual drawings mounted and displayed. In 1675, it was said that ‘the book has long been a wanderer’ but perhaps its very travels helped it gain a reputation for its artist. The drawings are apparently mentioned in art treatises from c. 1630, soon after it had reach Arundel’s collection. And, certainly, the display presently at Windsor demonstrates that Holbein’s images were considered worthy of copying in the seventeenth century: for example, Robert White produced an engraving of Katherine of Aragon, inscribing it with the words ‘H. Holbein pinxit’. The stimulus to reproduction may, in part, have been the identity of the sitter, but the inscription also suggests that Hoblein’s name was considered known or worthy to be known. Indeed, Holbein’s reputation could, at times, be a source of misattribution. George Vertue, whom we have already mentioned, painted a portrait of Edward VI in 1745, with the frame stating in gold letters ‘after Hans Holbein 1545’. The original, on display upstairs in Windsor (and on-line), is, in fact, no longer considered to be by Holbein; its present designation is either ‘Flemish School’ or ‘William Scrots’. In other words, the standing in which Hoblein came to be held left some of his contemporaries in the shadows. What is the moral of this tale? Perhaps it is this: we may tend, at times, to imagine that our own tastes reflect those of our forefathers and assume that the celebration of Holbein in the Windsor exhibition and in earlier ones, like that at the National Portrait Gallery in 1994 (from which I have taken some of the information above) or the ‘Dynasties’ show at the Tate the following year, is the latest stage in unbroken interest, dating back to the artist’s own lifetime. When we begin to realise that this is not quite so, we are liable to replace that ahistorical view with a narrative of the ‘re-discovery’ of the ‘Renaissance’, in which there is a path — not always easy but definitely visible — from forgetfulness to remembrance. But the information we have suggests something less linear and more interesting: a pattern of knowledge and ignorance across and within generations. The vagaries of attention shift back and forth and can only with injustice to the subject be simplified into a ‘direction’. And, indeed, moments of low regard, as might be imputed to Charles I’s giving away of the ‘great book’, could actually spur others to a better appreciation.